Skip the antibacterial hand sanitizer! The Journal of Antimicrobial Chemotherapy found you’d have to soak your hands in antibacterial gel for 9 hours to kill more germs than you would simply by washing with regular soap and water. And the FDA says antibacterial soaps and gels don’t prevent illnesses any better than regular soap. Plus, the active ingredient in many antibacterial products – triclosan – can lead to antibacterial resistance. That’s why the FDA recently banned it… and companies have a year to take it out of their products. So, skip the antibacterial gel – and wash with plain old soap and water. Halloween’s just around the corner. So, it’s time to talk about the dangers of decorative contact lenses. You might think it would be cool to wear golden contacts to enhance your vampire costume, or wear red lenses with your devil getup… But it’s dangerous. Wearing lenses that are the wrong size or shape, or aren’t sterile, can lead to an allergic reaction, swelling, conjunctivitis, cornea damage, or even blindness. That’s according to Dr. Andrea Thau, a spokesperson for the American Optometric Association. She says the only safe way to wear contacts – colored or otherwise – is to get a checkup and prescription from an eye doctor. In fact, it’s illegal to get lenses any other way. Why? Because the FDA regulates decorative contacts as medical devices – and they need a doctor’s prescription to be sold. So, be sure to steer clear of websites, beauty salons, and flea market vendors that sell them. Are baby carrots safe to eat? 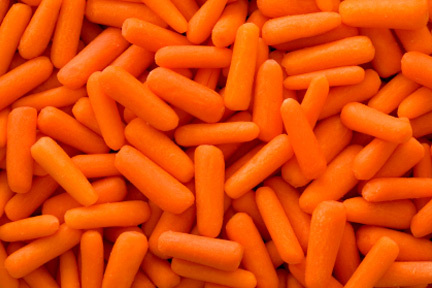 Have you ever heard that baby carrots are soaked with a toxic chemical and are unsafe to eat. This rumor seems to pop up every couple of months in e-mail chain letters, but it’s FALSE. The truth is that cut baby carrots, like bagged salad mixes and other “ready to eat” fresh vegetables, are rinsed in a weak chlorine solution to prevent bacterial growth. However, the trace amount of chlorine used is carefully regulated by the FDA, and not harmful.